Arabic keyword research is always considered as the cornerstone of any SEO campaign, paid search and content strategy. 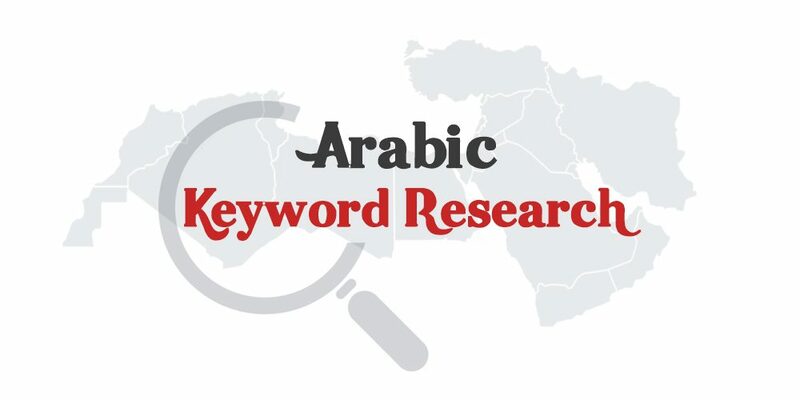 To build a successful Arabic keyword list, you will need an effective research to understand the local search habits and the difference between spoken Arabic and written Arabic. With 22 countries and different local trends, it is challenging to conduct a keyword research in the MENA region. The research in such language and marketplace has different nature. Spoken Dialects: There are different spoken dialects which would require a further research into local trends. There are five major dialects in the region including Gulf, Egyptian, Maghrebi, Levantine, and Mesopotamian Arabic. Culture: Arabic users have many search terms related to one keyword. A variation of keywords would need a further research into keywords relevancy. Consumer Habits: Some keywords could have a high volume in a certain country in the market while it has very low volume in other countries. You will need to conduct a further research on consumer search habits. Keywords Localization: Translating Arabic keywords from the English language will not provide an accurate result. Localization is also tricky from one country to another within the Arabic speaking countries. Negative keywords: Collecting the most accurate negative keywords in Arabic is very tricky. The Arabic language sometimes has very similar or typical terms to describe a wide variety of services or products. 1. Identify the seed keywords: Collect the initial keywords that are relevant to your business including brand names, products, services and locations you are targeting. The list is mainly created by the business owner to define their basic keywords and usually is provided in English or Arabic. 2. Use different keyword tools for exploring: Expanding the initial list by using keywords tools to collect relevant keyword suggestions, local search volume, competition level, relative frequency, suggested bidding, etc. Use more than one tool to get a different variation of keywords. You don’t have to follow a certain path to get the most relevant keywords. Sometimes Google search page can provide you with useful suggestions for long tail keywords and sentences. 3. Understand the trend of the keyword: Google Trends is a tool that will allow you to learn a lot from your keywords. It will give you data for not just today, but for a longer period of time. This will add another dimension for your keywords and will help you to understand when the search volume increase and decrease around the year. This is highly recommended for e-commerce keywords and B2B businesses. 4. Understand the consumer’s search habits: The majority of searches in the Arabic language are using long tail combinations, which means that searchers do not usually look for specific keywords, but rather many other keywords get a small number of hits as well. This requires more planning and deeper research to get the most relevant keywords which might don’t show high volume but it is effective to reach the audience. 5. Categorize the keywords: In order to have a strategic approach to your keyword list, you will need to divide your keywords into several categories. Branded Keywords, Industry Keywords, Transactional Keywords, Informative Keywords, etc. It is important to define the categories that are relevant to your business and marketing objectives. Each business has its own different nature of content that might vary and that’s why categories of keywords should be relevant. Keywords categories for SEO and content strategy would require more focus on context while categories for AdWords campaign would require more focus on bidding metrics and competition level. Furthermore, negative Arabic keyword research is essential for AdWords campaigns. 6. Set the priorities to build the strategy: By setting up the keywords priorities you will be able to define the strategy and action plan for your keywords. Defining which keywords will be used for content creation requires understanding putting together the priority factors of organic conversion. While in search engine marketing requires different priorities such as suggested biding, broad/exact, landing pages score, etc. Explore the competition and analysis your website and landing pages content before you set the proper metrics for keywords filtration. In conclusion: Arabic keyword research is not an easy task and requires a native speaker with solid experience in exploring the consumer search habits. Keyword tools are helpful to find relevant keywords but in order to get an effective keyword list, you would need to expand your resources. Keyword strategy is the main guideline to have a proper categorization and filtration for your Arabic keyword research. Avoid translating your keywords from English and run a culture customization based on the targeted market and consumer search habits. Finally, make sure you define the top relevant keywords for the Arabic consumer whether it is a local term, transcreation or transcripted. I hope this was useful and contact me if you have a question or looking for an Arabic SEO consultant.